Took three of my favorite people with me to catch some Christmas Spirit last week. We attended the holiday dinner and Christmas show hosted by the Idaho Falls A Cappella Chorus, also known as Sweet Adelines. Sweet Adelines is the largest singing organization for women, there are over 500 choruses worldwide. Four part harmony, also known as Barbershop is the style of singing they do, all a capella, and I love to listen. Last fall, my youngest, Haley, was invited to sing with Sweet Adelines in Idaho Falls, they have a wide variety of very enthusiastic members. She loved singing with them. In May, we traveled to Spokane, the week before her high school graduation, and competed with the Idaho Falls A Capella Chorus at the Region 24 Contest and Convention. What an experience that was. The choirs competing ranged in size from 15 to 180; the sounds and sights were spectacular. These girls don’t just sing, they perform too. Every song is a story, and the performances were incredible. The costumes are all sparkly, they seem to love glitter, the props were fun, the music inspiring. I loved the competition day. Our chorus competed for six minutes, they sang When I Fall in Love and The Moment I Saw Your Eyes. One is a ballad, the other has some serious tempo. The best part was seeing all those women come alive. The age range was 18 to almost 80, and every one of those women belonged on that stage. An experience to be sure, our choir came home with a bronze in their division, I was so proud of Haley, she added one more art form to her repertoire. Thank you to all of the women who performed last Friday night for our entertainment, what a great cause, and a great inspiration, I think I might have found my holiday spirit! 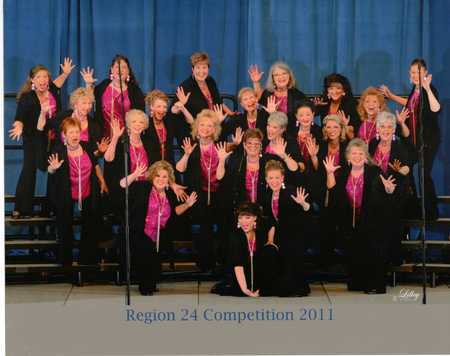 This entry was posted in Places, West and tagged Region 24, Sweet Adelines by Vagabond63. Bookmark the permalink.